After Boulder City High School’s boys volleyball head coach said her team was close to being great, the boys made a statement, winning the 4A Skyhawk Invitational at Silverado High School on Saturday, March 30. 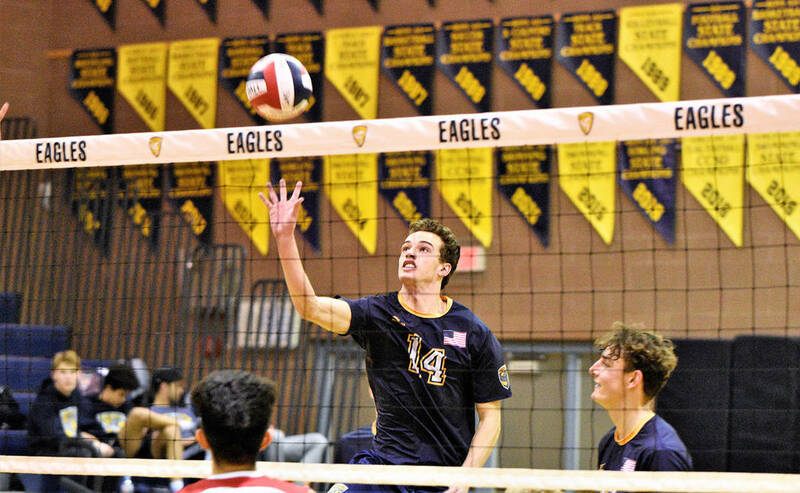 (Robert Vendettoli/Boulder City Review) Boulder City High School senior Karson Bailey, seen rising up for a kill against Del Sol on March 25, 2019, was named to the all-tournament team after helping the Eagles win the 4A Skyhawk Invitational at Silverado High School on Saturday, March 30, 2019. Defeating host Skyhawks, 25-15, 23-25, 15-11 in the championship game, senior Karson Bailey generated 17 kills and junior Preston Jorgensen tallied 11 kills. Battling back and forth with the Skyhawks, which defeated the Eagles in game one of the tournament, freshman Kannon Rose made 16 digs defensively, while dishing out 18 assists. Finishing 5-1 at the Skyhawk Invitational, the Eagles picked up victories over 4A opponents Rancho 2-0, Durango 2-1 and Sierra Vista 2-1, while also defeating 3A Western 2-0. Bailey and Jorgensen were each named to the all-tournament team for their efforts. Boulder City picked up victories over Sunrise Mountain 3-0 on March 25, Chaparral 3-0 on Friday, March 29, and Valley 3-0 on Tuesday, April 2. Currently ranked fourth in the 3A Sunrise with a 3-3 league record, the Eagles fell to the league’s top three teams, Mojave (6-0), Somerset Academy Sky Pointe (5-1) and Del Sol (5-1), to start league play, but Huxford thinks this group is starting to find its groove and is excited for upcoming rematches. Defeating Valley 25-11, 25-14, 25-16, Jorgensen led the way with 14 kills, freshman Kenny Hill generated 10 kills and junior Boen Huxford dished out 20 assists. A rejuvenated team, the Eagles will travel today, April 4, to Somerset Academy Losee, before hosting Somerset Academy Sky Pointe on Monday, April 8, and traveling to Mojave on Wednesday, April 10.